As consumers, we usually prefer buying products that we have positive feelings about. There is no need to read lengthy studies in order to draw a correlation between one’s positive experience with a product or service, and one’s willingness to pay a premium for it or to make additional purchases. For evidence of that, just take a look at many Amazon reviews which include statements like “I love these shoes, so ordered another two pairs.” Unlike most purchases made on Amazon, however, the end users of enterprise technology products are not always the ones that decide what solution to buy, even though end users often depend on these technologies to do their everyday jobs. When I was a storage administrator, my managers were not very interested in the GUI of a storage solution or what steps were necessary to provision storage for a database instance with it. 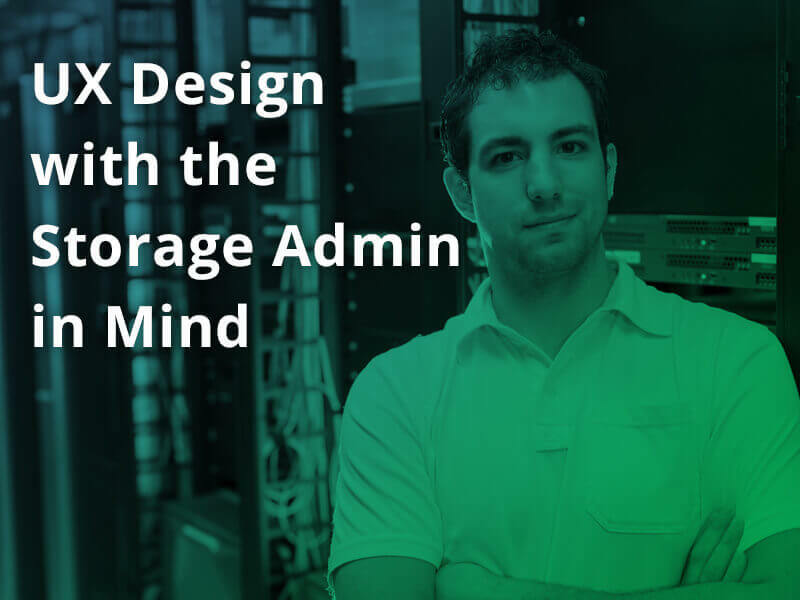 When they evaluated storage solutions, the decision was weighted more towards the price point, acclaimed features, inside politics and perspectives on the vendor, instead of the day-to-day needs of the storage administrator. When I joined INFINIDAT as an interoperability engineer, the first product manager I spoke with insisted that his goal, and that of the company, is to try make the storage admin happy. Here are some thoughts on whether they’ve achieved that goal, based on my experience as a storage admin. One of the key elements in the design of the InfiniBox management is its simplicity, this is a guiding principal that goes all the way from its off-the-shelf hardware components on through to host connectivity, storage allocation and data management. Like with other successful products, such as Uber (or Gett), Netflix or the iPhone, the goal with InfiniBox has been to remove friction and let you get your job done more easily and without a hassle. I’ve worked for years on storage management consoles (aka CLI or Command Line Interface) of various storage array vendors, some more user-friendly than others. There was a learning curve with all of them that often involved typing ‘help <command>’ many times and reading through the relevant options and examples. When I started at INFINIDAT it was just the contrary, you don’t need to spend lots of time learning the basic commands and this is thanks to Infinishell. Like most modern Linux systems, with Infinishell you just start typing a command while pressing Tab and this will complete either the command or option you are using. If there are a few options, it will show you the relevant ones when you press a double Tab. This is true also for values which are already configured on your system, like host names, volume names, pools and even port wwpn’s! This is both fast and reduces the possibility for human error while typing, so bye bye to copying and pasting commands like a dog. This example shows Tab-Completion in action, with all possible options for volume name beginning with “sap,” and then the output for vol.query command. Another cool option that helps to get things done more quickly is using script mode where you prepare a simple file with the sequence of commands that you normally would type manually on the console. This option lets you run the script once, pointing the Infinishell to the file where you can register numerous hosts, create hundred of volumes and then map to these hosts in less than a minute. As a storage admin, one of your responsibilities is connecting the hosts to the array and provisioning needed storage according to the characteristics defined by your internal clients. With most other storage arrays, there are usually disk pools or aggregates that are defined for specific needs like backup, db archive logs, shared file systems, virtual machine workloads and more. This concept is also known as tiering. Each policy includes parameters like disk type, RAID level and resiliency. Allocating capacity for these pools requires some planning, which involves getting the plans and predictions from the business concerning how much storage they will use. This can be very hard to get right and you risk either being left with no space on the pool or the need to perform some ugly migrations, in case you cannot add capacity. With InfiniBox, there’s no need to define any special settings for a storage pool, there is an equality with storage pools and the only thing you can enable / disable is ssd_cache. Generally, you get the best performance from all pools, because they benefit from INFINIDAT’s unique RAID-like architecture. This fact simplifies data management, reduces costs and has the added benefit of making it easy to delegate storage management to other groups. You only allocate as much space as needed while this pool can be resized in the future. Delegation is very important in today’s evolving IT environment, where the DB, virtualization or DevOps admins can also provision storage. You’re probably wondering how can you make sure that all other technical aspects are covered and this is where INFINIDAT’s Host PowerTools come to the rescue. One of the hurdles of configuring block storage is the complexity and level of expertise you need to have in regards to the host configurations like multipathing, timeouts, HBA settings and more. These are usually host OS dependent and can be critical to both performance and availability. Host PowerTools does all the above configurations automatically and can perform many other useful tasks that help the admin navigate through the storage network. After installation, Host PowerTools is used with the infinihost command. There are a number of very useful command options. These include running ‘infinihost connectivity list’ and ‘infinihost volume list’ that shows in a simple view the volumes that are mapped to the host and number of paths, so you can verify that everything is as you intended it to be. Provisioning storage from the host is very powerful because you can let each team carve storage from their own pool without routing the request through the storage admin. These are just a few examples of how InfiniBox distinguishes itself from other storage arrays through the simplicity of its user experience and focus on making the storage admin happier and more productive. Some of the inspiration for this post came from the brilliant Exponent podcast series on tech and society, specifically this post on the importance of user experience in building dominant companies. Igal Katzir is an interoperability engineer at INFINIDAT and part of the team responsible for testing and certifying that the company’s storage solutions work with various operating systems, storage networking hardware and vendor specific applications like SAP-HANA, Veritas Cluster, VMware and more. Prior to joining INFINIDAT, he was a storage manager and part of a team responsible for managing a large SaaS infrastructure. Additionally, Igal worked for a systems and security services group serving as a project manager and system administrator for various customers. He has a bachelor’s degree in business administration and began his career in marketing.